Karen Blanchard and Krystal Bick don’t usually plan their matching outfits, but showing up to outings in identical looks is how they became each other’s biggest fans. In fact, take a tour of their closets and you’ll find the exact same pairs of shoes, bags, and dresses. Even their jewelry share DNA: they have identical gold necklaces, both ladies favor layering moon, shell, and ancient coin pendants like a constellation of tiny souvenir bling. “We’ll see each other’s Instagram and go, ‘I have that too, I have that too!’ and it’s just pure coincidence.” says Blanchard. The two bloggers and influencers share a “style brain” and it has proven creatively expansive for both of them; they may own the exact same dress, but Bick prefers keeping things classically feminine while Blanchard is always looking for cool ways to upend different pieces—to clash. And they both admit to taking inspiration from the way the other approaches shopping and getting dressed (much like their followers take inspiration from them, in turn). Blanchard was born and raised in London, but started Where Did You Get That in the early days of living in New York. It started as a creative outlet from her day job; like many of us she wasn’t satisfied at work and used fashion as a way to fill the void. Then she turned it into a viable career landing her in the pages of Vogue (along with three other influencers) as part of a beauty campaign within a year. We caught up with the ladies on their home turf of NYC. In true bestie fashion we challenged them to pick the same Express denim pieces and style them in their own idiosyncratic ways. 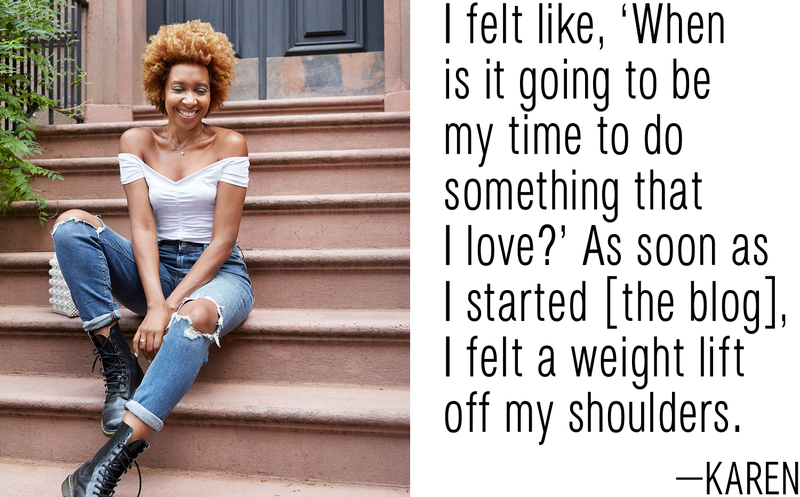 We also asked them to give us some insider tips for finding the most flattering jeans for your body, and dish on how to shop for vintage gems without getting overwhelmed. What should every woman know about shopping for quality denim? Bick: I look for denim that has a good weight to it. Because I feel like if it’s not too flimsy, it’ll actually wash really well and stand the test of time. Blanchard: I love the waistband tip. The majority of jeans, ones with a straight leg, will have a waistband length that matches your neck circumference left to right. Take the jeans and just wrap the waistband around your neck, if the ends meet, it’s most likely going to fit you. So that’s good if you’re pushed for time. STAIR MASTERS: When you’re a blogger and influencer, your day sometimes starts with finding the most photogenic places to take a quick pic. 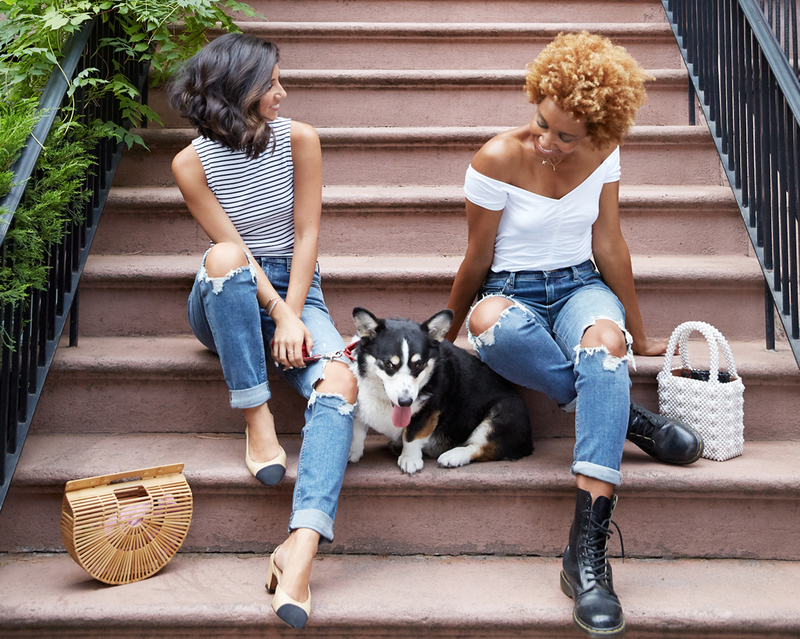 Enter the West Village stoop—a Krystal (left) and Karen (right) classic. Check out Krystal’s channels for more closeups of her amazingly adorable dog, Elvis. What about finding the most flattering fit for your body? Bick: I’m 5’4”, and I have short legs. So I usually end up cutting most of the lengths of them, and I love a raw hem anyway. I’ll literally just take a pair of scissors, cut off a couple of inches to make it cropped at my ankle and call it a day. I think I’ve done that with all my Express jeans actually. Blanchard: You can get straight, skinny, high leg, high waist, flare, boot-cut, cropped, but it’s really just about going back to what suits you the best. Don’t feel like you have to try every different style. If it ain’t broke, don’t try to fix it. Bick: Pocket placement gets overlooked a lot. I mean, butts are hard to fit. But from a functional standpoint I’m somebody who always likes to put my hands in my pockets, front and back, so if the pocket are too small, and I can’t really fit a phone in there, the jeans are useless to me. On top of that, I think if the pockets are too small it opens up a lot of space back there making things look larger than they really are. SHOP THE LOOKS: One Eleven Striped Ribbed Mock Neck Tank, High Waisted Ripped Rolled Hem Original Girlfriend Jean, One Eleven Solid Ruched Off-the-Shoulder Tee. Can you remember a time as a kid when you realized you were in love with fashion? Blanchard: I grew up with my mum in London, and we didn’t have much money, and every Saturday, it was our shopping day. My mum was a midwife, and every Saturday we’d go down to our favorite local market, street market, and we’d buy clothes. Always for cheap, and we’d come home, excited, the bag full of inexpensive clothes. We’d empty the plastic bag on the kitchen table and play dress up. She would get the biggest buzz out of doing it, and knowing that we paid so little for something that looked so good, in our opinion. SIDEWALK SERIES: Coffee and content are two must-haves for any hustling blogger. Bluestone Lane on Greenwich Avenue is a perfect place for a midday work meeting with a collaborator. Bick: I have a younger sister which meant that I had a built in friend, for most of my life. We did everything together. At the time my dad did broadcast journalism, his idea one Saturday morning was ‘Let’s make a news program with you two as the anchors.’ It was up to us to come up with the script and the stories we would tell. We did on location bits, and my dad was the camera man for us. We went through my mom’s closet and put on different outfits for each segment. My mom unfortunately, came home to a torn apart closet and all her shoes everywhere. SHOP THE LOOKS: Collar Surplice Thong Bodysuit, Mid Rise Denim Mini Skirt, Contrast Stitch Denim Trucker Jacket. How do you prioritize when you go into an overwhelming vintage space? Blanchard: It’s like rolling up your sleeves mentally and just like getting stuck in. Look at materials, if something looks stiff and too cheap I don’t even touch it. I want the fabric to be soft, so it moves nicely when it hangs. I look at the print, because prints date or they don’t date a garment easily and I’ve said to my followers on my youtube ‘Try and avoid really massive prints, go for smaller prints because they stand the test of time.’ You’re gonna get tired of five giant flowers all over you by next year. But if it’s got tiny faded flowers, it’ll tend to last longer. Bick: See if you can find potential in things. Sometimes it’s hard to find pieces that are exactly in your size. But if you have a great tailor then it’s just a matter of finding the potential in a piece. If you do find something in an amazing color or an amazing print, sometimes simply throwing a belt on it will help give it some shape. Blanchard: And don’t forget the power of accessories because accessories fit any body, so make a beeline for the vintage bags. To me those are the jewels in your closet, they stand the test of time especially in the era of “it” bags. It’s nice to have something that’s timeless and unique. 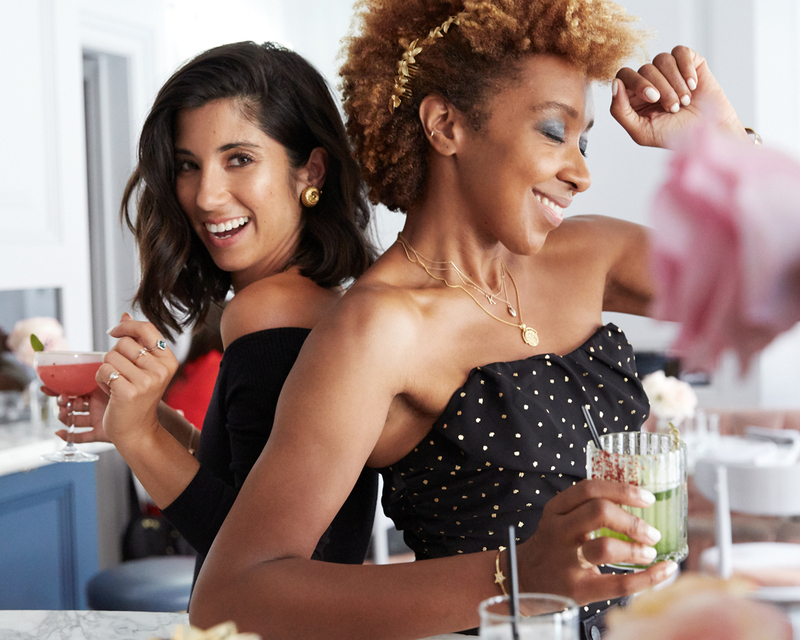 SUMMER SISTERS: Twinning at a party doesn’t have to be embarrassing. Karen and Krystal regularly realize they have the same pieces, but their styling is so perfectly unique, they never look the same. Hot tip: While We Were Young is a super chic restaurant backdrop for some cocktail content. Bick: I mean we’re essentially small business owners. At the end of the day we’re the CEO, the marketing rep, the PR person, the SEO engineer, the tech person, the janitor. I mean literally every role that’s on our roster, we more or less fill, which I think is really liberating, but can also be very exhausting, if you let it. So I think it’s reminding yourself that you’re not alone in this, there’s other women that are happy to help. And sometimes just purely reaching out, whether it’s a cold email, a DM, a comment on a social media platform, actually can go pretty far. Blanchard: Your love will motivate you and it will be your driving engine to keep doing things on days that you’re not paid as well as days when you are. But it’s what keeps you going, it’s what keeps you wanting to answer comments, and fill all your social platforms and keep going on a daily basis, monthly basis, yearly basis. It’s your love that keeps you going. and I think it keeps your audience hungry too, because they can tell if you’re genuine. SHOP THE LOOKS: Metallic Dots Side-Tie Ruched Tube Top, Destroyed Denim Mini Skirt, One Eleven Modern Rib Off-the-Shoulder Tee.